Figure 3-26. Development of Time-Travel and Time-Velocity Curves for Period Before Unlocking. corresponding ordinatcs of the curve in fig. 3-24, measuring these ordinates above the zero axis. Before proceeding, it is necessary to selcct the characteristics of the bolt driving spring. Since the only purpose of the bolt driving spring is to assist the return of the bolt to the battery position, and since this spring is not required to absorb all of the bolt recoil energy, the magnitude of the forcc exerted by the driving spring is not critical in the design. For this reason, the characteristics of the spring may be selected more or less arbitrarily. 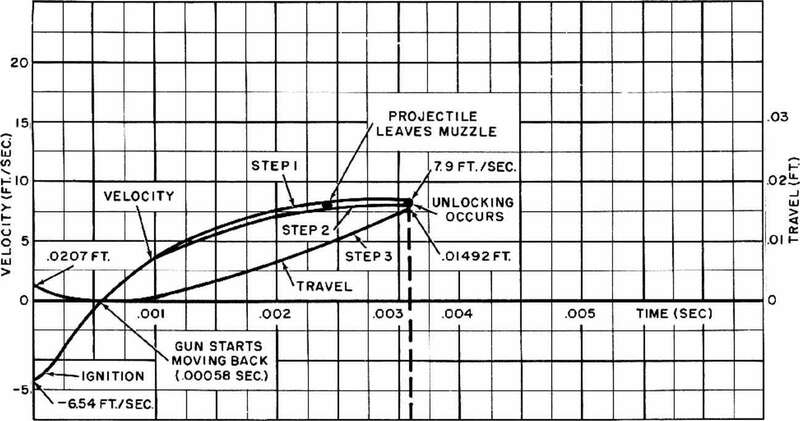 In order to permit a high rate of fire, the spring should be made relatively light so that it will not offer a high retardation to the rccoil movement of the five-pound bolt, but on the other hand, the spring should be heavy enough to provide adequate force for assisting the closing of the bolt. Taking both of these requirements into consideration, it appears reasonable that an initial compression of 25 pounds and a spring constant nf 10 pounds per inch should produce the desired action. If it is assumed that the bolt must open 10 inchcs to permit feeding, the maximum force exerted by the spring will be 125 pounds. This is a reasonable value and is not high enough to causc excessive difficulty in charging the weapon. In the analysis of the motions after unlocking, two factors must be taken into consideration. First at the instant of unlocking, the barrel spring has been compressed 0.01492 foot (fig. 3-26). This means that from the time of unlocking on, the initial compression of the spring must be increased by the effect of its spring constant for this deflection. 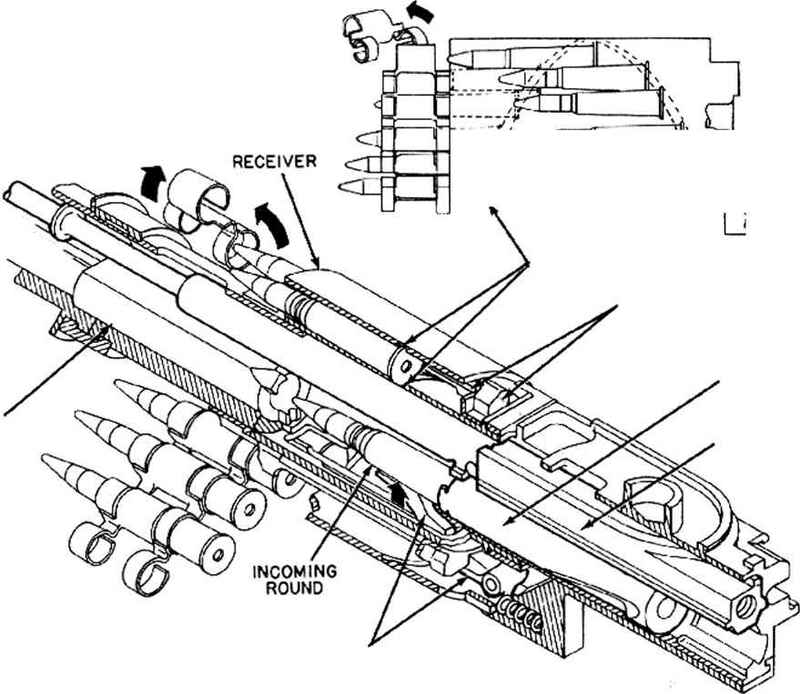 Second, it should be realized that after the bolt is unlocked, the forcc of the bolt driving spring exerts a rearward thrust on the gun. Although this force is relatively small at first, it should be taken into account by subtracting the initial compression of the driving spring from that of the barrel spring and subtracting the effect of the spring constant of the driving spring from that of the barrel spring. It should also be remembered that the movement which must be considered in determining the force produced by the bolt driving spring is the relative travel between the bolt and gun.